Being in Pennsylvania, I really get to experience the seasons in their full effect. It's been drizzly the last couple of days and thundering in the late evening/early mornings. Yesterday and today have been the first real signs of Autumn for me. I'm not sure what defines the seasons for you, but for me it's the smell. Everything is still very green but the wind carries this heavier sort of smell as if to say"One last clean before hibernation". It's a special sort of comfort to look around, to feel the higher powers working their magic and know that while Summer is leaving, we will see it again. So I offer up a question to my readers, what is Autumn to you? Do you have any special traditions that you celebrate to welcome in this season? For me, It's time to pull out the hot apple cider and consider crocheting myself a new scarf or hat. On a final note, I am preparing for KuroKiiro(formerly Tekko 1/2). It is a local Japanese Anime and Manga convention in Pittsburgh. It is very small but I wanted to support our local convention, plus I am hoping to see some convention friends! Anyways, in preperation for this I made a new item today. 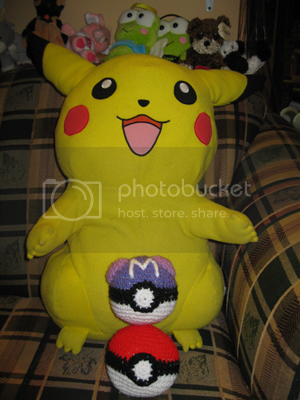 It is a crocheted version of the MasterBall from Pokemon. The MasterBall is the most epic of all balls, being able to capture any pokemon, regardless of level or strength, instantly. I love the color scheme so I had to do it. Here it is pictured with a standard Pokeball. Pikachu is careful to not be captured as he prefers to run the apartment free with the others. And in the spirit of colder weather, one of my rainbow scarves that will be appearing on my website soon. These babies are taller than I am, between 6.5 - 7 ft! I am 5'8. I adore the colors and think they are perfect to keep away the winter blues. Autumn, being my most favorite season ever, is cause for baking and decorating and picture taking. I love the cooler weather and the color of the leaves in the trees. I make pumpkin seeds and relish all other things pumpkin... like ice cream and pumpkin roll. I literally get a thrill the first day I see the autumn merchandise in the stores, and when I catch that hint of cool, leaf-touched scent on the air... It's magickal! That said... Congratulations on the new blog, and here's to the future success of Manifested Dreams! Mmm Autumn! I think this is the first year, though, that fall seemed to realize it was vacationing a little too long and returned rather abruptly. Suddenly, it's a little chilly outside and the trees are frantically trying to dump their leaves like a nervous drug dealer with the po-po outside his front door! It's definitely time to buy apple cider and pull out the long sleeved shirts. :3 Mom'll start making pumpkin rolls (which'll be gone in a day). Love the new blog, Buns. 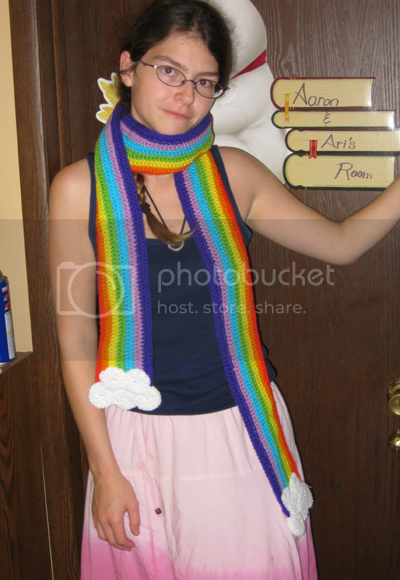 And that rainbow scarf is still the cutest thing I've ever seen! Good luck at the con, and Happy Autumn!